WSPC’s love of Dragon Boating started with a cricket match in 1987! WSPC were due to play Eton Excelsior Rowing Club (EERC) at cricket, but it was rained off, so we had an afternoon of bar games in the EERC club house. On their notice board was an application form to enter the first British Dragon Boat Association (BDA) National Championships, which were then held in conjunction with the Westminster Serpentine Regatta on the Serpentine in Hyde Park. We ‘borrowed’ their entry form and the rest as they say, is history. 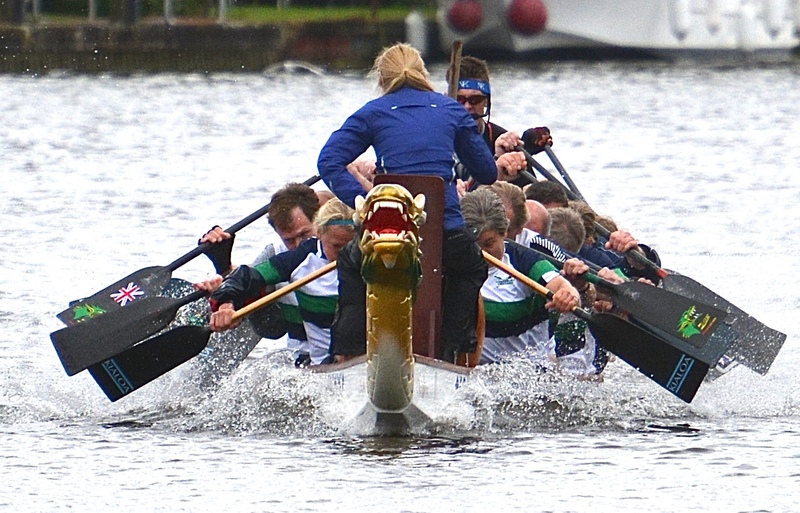 In the early days, the British Canoe Union and the Amateur Rowing Association (ARA) were vying for control of dragon boat racing in the UK before the BDA was formed, and the ARA had sent crews from the North East and from the Thames Valley to compete in the Hong Kong International Races. WSPC and the Kingston Royals are the only clubs still in existence that competed at those first Championships. For those who take their timing from the drummer, we rather bucked the trend, as our first drummer was Rick Lee from Ten Years After; he was much bigger than your typical drummer these days, rather did his own thing and thoroughly enjoyed himself. You might also be surprised to hear that Smithy, one of our old Captains, was the stroke! In the first Championships we reached the semi-finals before being knocked out. Our endeavours are captured on a professional video of the event (Tony Cross has a copy), which shows how luck smiled on us as we were last in one race before the other crews crashed into each other as no one really had any helming experience then, and WSPC calmly, if not a little slowly, paddled past the wreckage to take their place in the next race. This was in fact our worst performance in the National Championships, as after the inaugural year, we always made the grand final, but never made the top three, 4th or 5th being our top finish. Dragon boating was then something we all did for a bit of a change as the emphasis was still on skiffing and punting. When we decided to enter an event, we would see who was available, have an outing on a Thursday night to work out where we were going to sit and that was it. Youth, fitness and an understanding of watermanship always got us through, even against crews whose sole interest was dragon boating and trained for it. The ‘demise’ of WSPC came when the BDA and those crews that purely dragon boated got fed up with crews like WSPC just turning up and racing, sometimes just at the National Championships and doing quite well. The BDA firstly implemented a minimum number of events to be attended and then introduced the current league structure and while we continued for the first couple of years, we then stopped. The Club has also been used as a base for other crews, firstly The Criterion from Windsor and then BA Hurricanes. We also started a ‘relationship’ with Moss the Chemists corporate team who undertook both corporate and charity events and who eventually evolved into Wraysbury and Moss (WAM) and now back into Wraysbury.